“Borgata” is the name of the restaurant. 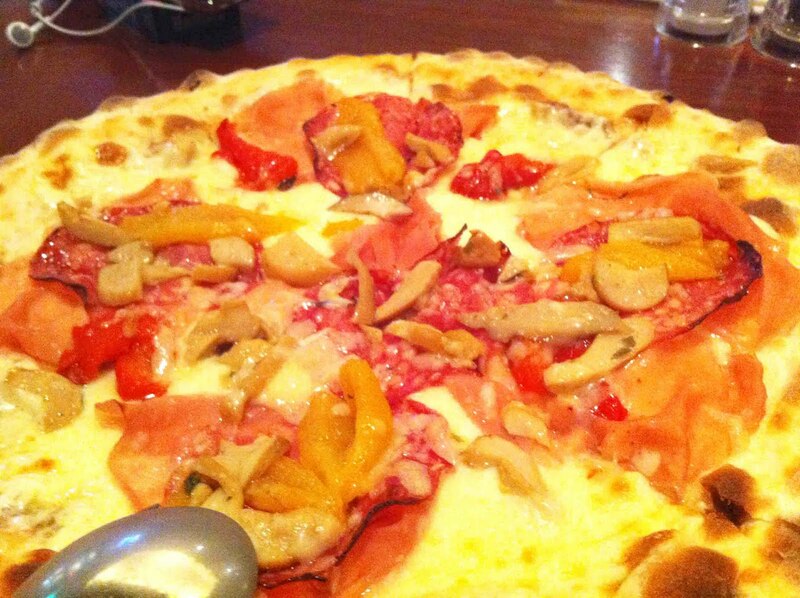 “Trattoria” is actually an English word, meaning Italian restaurant serving simple food. “Osteria” is an Italian word, meaning Italian restaurant serving simple homecooked food. So “Borgata Trattoria Osteria” means Borgata Restaurant2. Borgata Pizza($25), huge enough to be shared by two-three persons. I ate 6 slices all by myself! It’s a mozzarella-based pizza with ham, salami, capsicum, porcini and parmesan. You’d think that the pizza which is named after the shop–or is it the shop named after the pizza–would be good. You’re wrong. The pizza was one of the worst I’ve eaten. There was a very strange taste to it. It was an unpleasant earthly taste (no, not from porcini mushroom which gives off a very pleasant taste). The pizza was also bland by itself and the salami was too salty. The parma ham (was it parma?) tasted strange too. 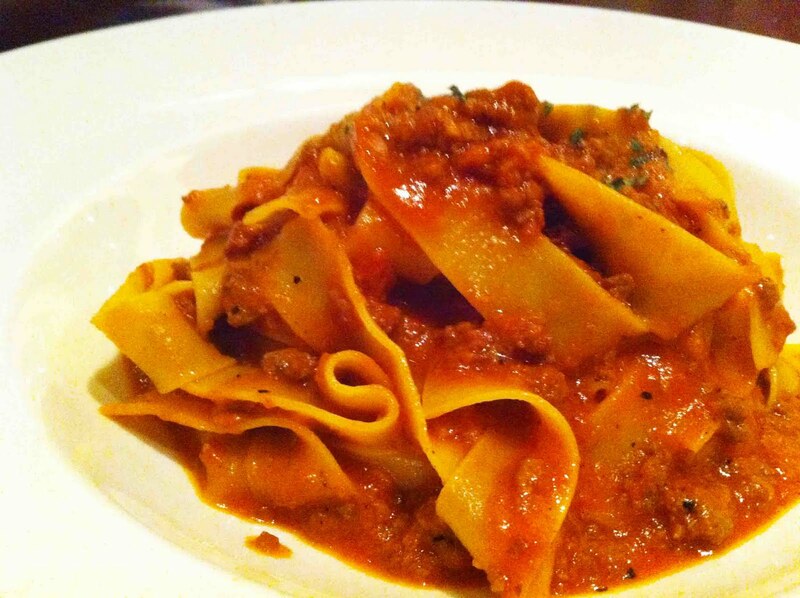 Pappardelle alla bolognese ($18). love the name of the pasta, pappardelle, which are long and thick ribbons. Usually thicker pasta goes with thick sauce and thin pasta goes with thin sauce. Tomato-based sauce would be thin, I guess?, so this combination was strange – but then, what could go wrong with tomato sauce with beef and pork? 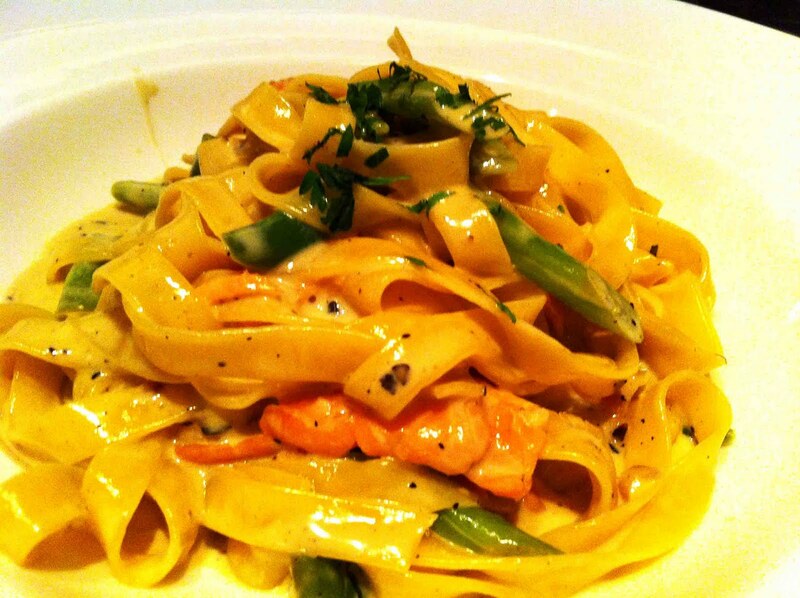 Fettucine al salmone ($23). Fettucine with smoked salmon, french beans, brandy in pesto cream sauce. Extremely salty, almost inedible. We should have sent it back but I think 14K forced himself to finish this because (I suspect) this is the first time he met my sister and he didn’t want to look difficult. A+ for putting in effort. Linguine al cartoccio ($24). Mixed seafood including clams, squid, prawn, and crayfish, wrapped in foil. This was truly delicious. 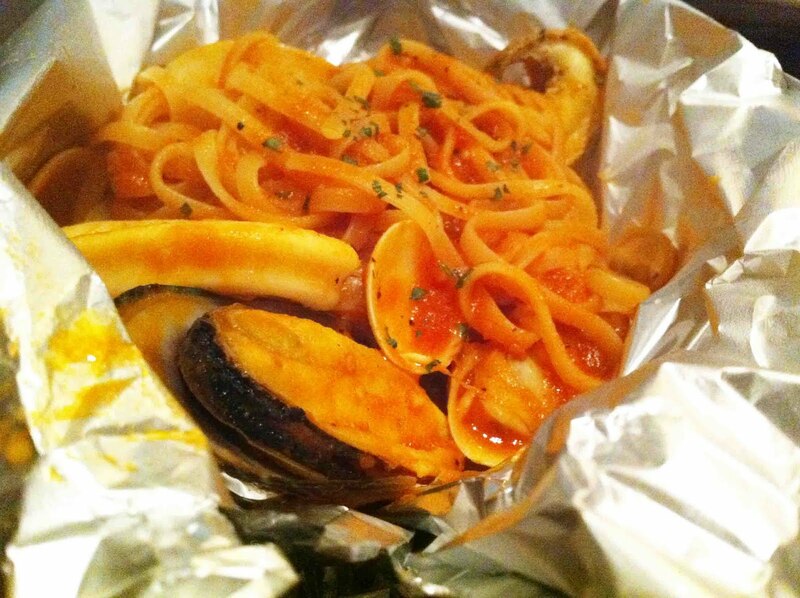 The sweetness of the seafood infused into the tomato sauce completely, changing the sauce taste, giving it a zesty tinge. But the seafood was small and not very fresh. Tiramisu ($9). The MasterBaker, 14K, told us that tiramisu was invented during the war. The women were missing their husbands and boyfriends so they threw a few ingredients together, ingredients that didn’t need to be cooked, to concoct this dessert. My sister said, the first woman who invented it must be called Tira. So it’s Tira-Miss-U! Apparent, the Tira of this restaurant doesn’t really missed her boyfriend, so her tiramisu wasn’t good. It had bits of white chocolate, which had a nut texture, that we didn’t appreciate. 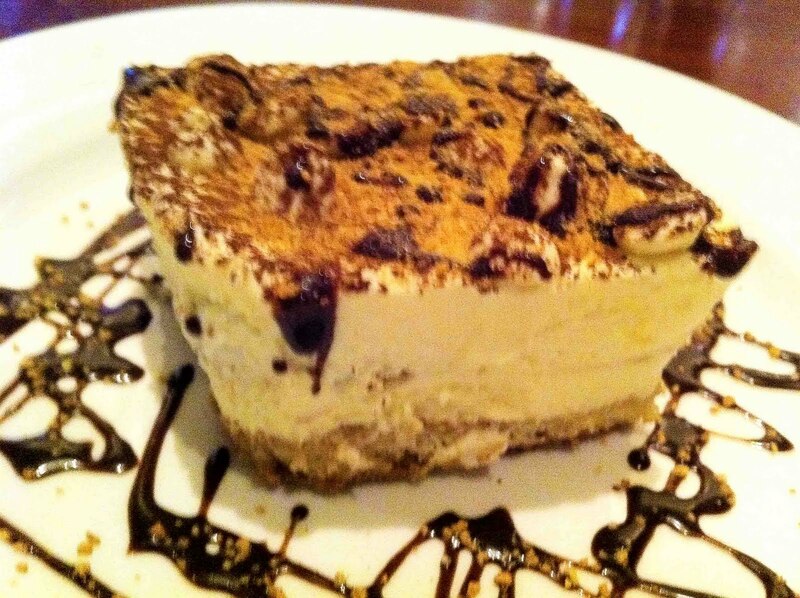 The white chocolate’s sweetness competed with the tiramisu, giving a conflicted taste. Where is the rum? The service was good but careless and forgetful. We asked for butter but the waiter delivered it to the next table. Quiet ambience, good for dates and conversations, not much of a decor. Overall, the food was disappointing after so many good reviews on HGW. But the price was ok.